Higdon had a career-high 30 carries, ran for 115 yards and scored two touchdowns to help the Wolverines rally from a 17-point deficit to beat Northwestern 20-17. 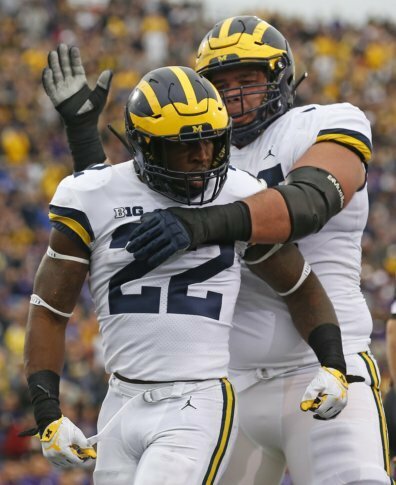 ANN ARBOR, Mich. (AP) — Michigan running back Karan Higdon packed on about 15 pounds on muscle during the offseason, hoping the extra weight would help him give and take a pounding. Two days later, the 5-foot-10, 205-pound senior insisted his body felt fine. He credited the team’s strength and conditioning staff for getting him ready for the performance and the recovery. No. 15 Michigan (4-1, 2-0 Big Ten) will likely lean on Higdon to carry a heavy load against Maryland (3-1, 1-0) on Saturday at home. Higdon is averaging 119.8 yards rushing per game, ranking second in the Big Ten and ninth in the nation. He has been slowed down just twice this season. Notre Dame limited him to 72 yards and a score on 21 carries in its season-opening win. Higdon missed the SMU game two weeks later with an undisclosed injury. In his past three games against the Wildcats, Nebraska and Western Michigan, he has averaged 136 yards rushing. Higdon has caught just two passes this year, gaining 9 yards on one catch and 7 on the other. Running the ball, though, is what he does best and he no longer is getting the ball exclusively on plays set up between offensive tackles. While Michigan’s offense is much improved because of quarterback Shea Patterson, it has been able to move the ball and score because of the balance provided by a Higdon-led running game. It also helps that the offensive line is creating larger holes than it did last season and is giving Patterson plenty of time to throw. The offensive line, in turn, loves blocking for Higdon because it enjoys watching him punish players who try to tackle him.